There are several reasons why you might be interested in figuring out whether a front-load versus top-load washing machine best suits your needs. One could be that you’re in the market for a new washer, and you want to know things like front-load washing machine pros and cons. Or, perhaps you’re moving to a home that already has appliances, and you’re interested in determining whether the high-efficiency top-loader (vs. front-loader) is something that you want to keep or replace. You might even be interested in increasing the energy efficiency of your home and want to know the top-load vs. front-load washers’ pros and cons. What are the most energy-efficient washers? The most energy-efficient washers tend to be high-efficiency top-loaders, according to Consumer Reports. Its research and testing indicates that the “winner” is a high-efficiency top-load washer vs. front-load or top-load with a center agitator. 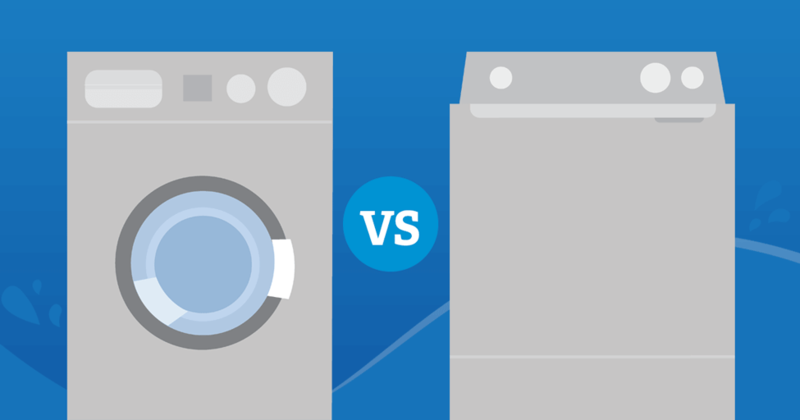 First, let’s look at the difference between a front-load washer vs. top-load washer. A traditional top-loader will float your clothes in water and rotate them with a center agitator. A front-load washing machine rotates the drum to move the clothes, rather than having a pole-style agitator in the center. Similarly, a high-efficiency top-load washer doesn’t have an agitator. Instead, there’s a wash plate at the bottom that “tosses” the clothes. The Consumer Reports results showed that in a test between a high-efficiency top-load washer vs. front-load machines, high-end front-loaders tended to use less water and were more effective at cleaning clothes, but there are still good reasons to choose a high-efficiency top-loader. 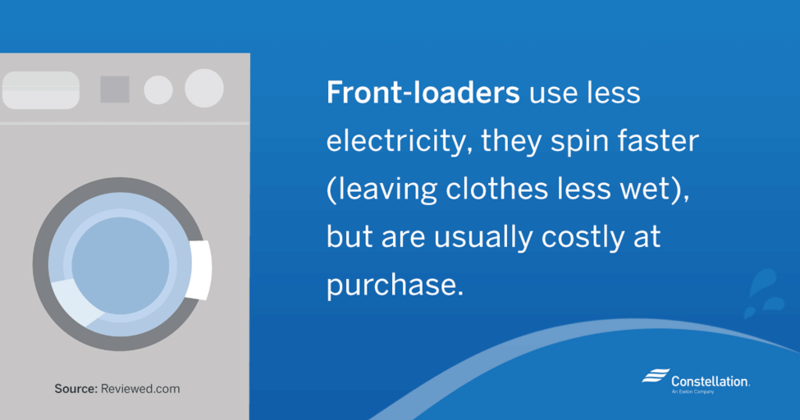 Front-loaders use less electricity. 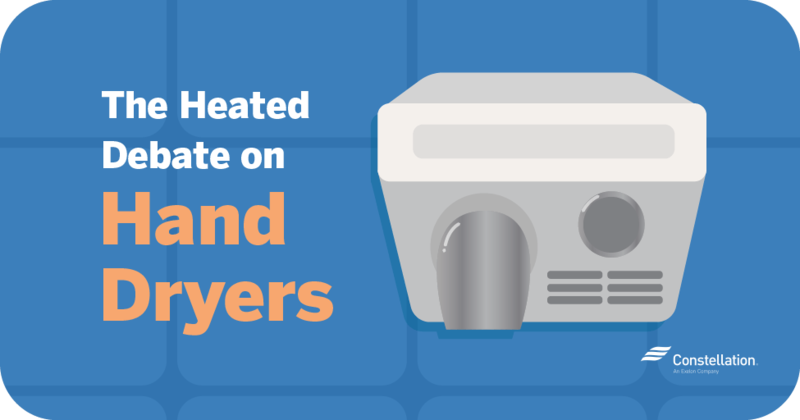 According to tests performed by Reviewed.com, front-load washers cut electricity use by up to 50% when paired with an electric hot water heater. Front-loaders leave clothes less wet at the end of a wash cycle. The scientists at Reviewed.com also suggested that front-load machines spin faster than top-loaders, and therefore leave clothes 10% drier, which means that your clothes dryer doesn’t need to work as hard or dry as long, which also translates to energy savings. Ergonomics — the “bend over” factor. Some people dislike front-load washers for one simple reason: They need to bend over to put the clothes in and take them out. For some people, especially if there are physical limitations, that low bend might be a problem. Front-loaders can be more costly at purchase. As with any appliance, the upfront cost will depend on the brand, features and how many “bells and whistles” you choose. But, on purchase price alone of comparable models of top-load vs. front-load washers, the front-loaders tend to be more costly. 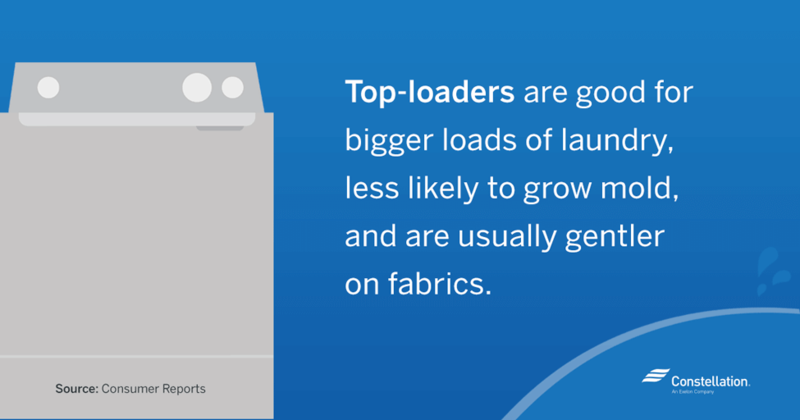 High-efficiency top-loaders tend to clean clothes better and be gentler on fabrics. That’s according to Consumer Reports’ product testing of 43 high-efficiency, top-load washer (vs. front-load) models. Faster spinning means less drying. While one of the high-efficiency, top-load washing machine benefits is that it spins faster than a machine with an agitator, it also means that fast spinning could cause clothes to tangle, so you want to be sure to untangle items before placing them in the dryer. Large capacity. Because a high-efficiency, top-loader has no center agitator pole, it has more room and can accommodate a bigger load of laundry. Less vibration. One common washing machine complaint is that the appliance can cause a vibration on certain kinds of floors. Often this is less of an issue for a front-load washer vs. top-load washer, but the high-efficiency top loader vs. front-loader has an even better Consumer Reports score on vibration. Less opportunity for mold growth. Mold growth in front-load machines has been a problem for a long time, and it actually has been the reason for lawsuits against some large appliance manufacturers. However, Consumer Reports indicates that mold doesn’t seem to be an issue for high-efficiency top-load washing machines. Significant potential for repair costs. High-efficiency top loaders tend to be more complex than standard top-load washers, and the more features that are added to an appliance, the more opportunity there is for something to go wrong. In the comparison of high-efficiency top-load vs. front-load washers, there are similar maintenance and repair costs because of the complexity of both. High-efficiency top-loaders must be used with specific detergents. Because there’s so much less water involved in a high-efficiency top loader cycle, it needs detergent that is formulated to create fewer suds. Therefore, you must use detergent that is marked “HE” on the label. 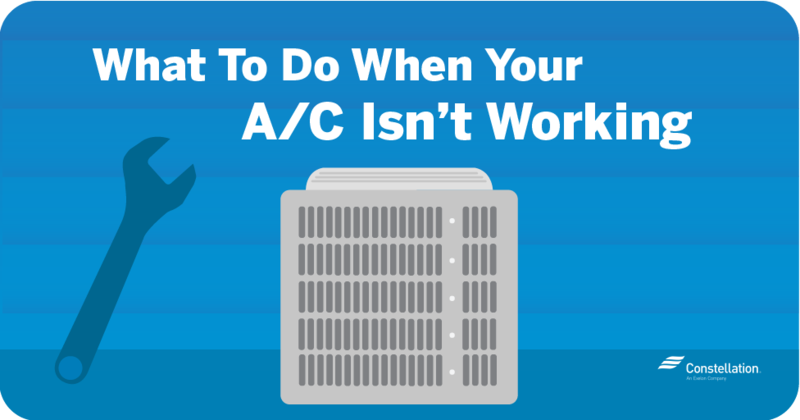 Otherwise, a manufacturer might not honor the machine’s warranty if it breaks. You might not have realized that there are so many factors to consider when determining whether a front-load washer vs. top-load washer is the right choice for your laundry. Whatever your reason for choosing a front-load washer vs. top-load washer (or the other way around), there are ways to reduce the amount of energy that you’re using on your laundry. One is that you could consider air-drying your clothes either on a drying rack or on a line outside. They’d have that fresh outdoorsy scent, and you’re not paying a penny for electricity! A second way to conserve energy and save on laundry costs is to only run large loads. By limiting the number of times you run your laundry cycle, you will be saving — regardless of whether you have a front-load (versus top-load) washing machine! How do you save energy when doing the wash? Share with us in the comments below! My last front-load lasted 9 years and now we may need to get another one (8 years later). I can’t see how this is saving us money if we need a new one every 8-9 years. And what is it doing to the environment…all of these plastic parts going to waste. I guess top-loaders will be in my list now. Thanks for the info. Hi Ace, you’ve made a great point. Even though front-load washers are usually more energy efficient, if you’re noticing that your front-load washer needs to be replaced more often than you thought, we agree that perhaps getting a top-load washer is best for your scenario. Hi Iggy, You definitely make valid points. We understand your appreciation for regular top-loaders, they’re served us so well for so long! As an energy supplier, Constellation cares a lot about energy conservation, but also about water conservation, and HE washers (top-loading and front-loading) use less than half of the water than regular washers did 18 years ago. 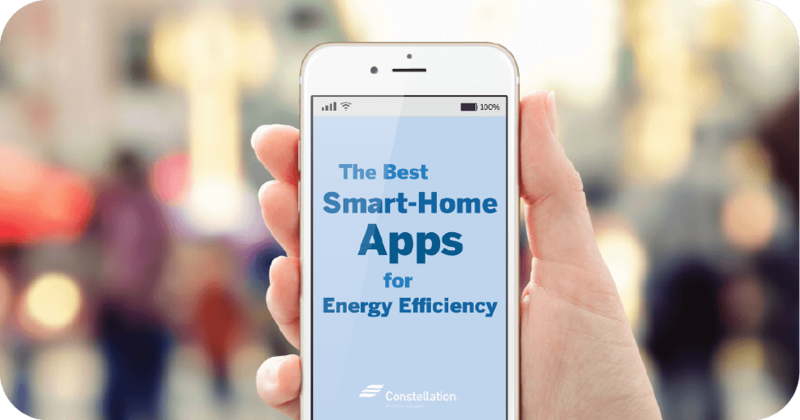 We love to give our customers and readers different tips and advice on energy matters, but we always want you to make the decision for yourself! We’re glad to hear that you’ve done your own research and found the one that’s best for you.